This is about Nelson, a serial killer who, after each murder, leaves a chess diagram in the scene of the crime. These chessboards give the detectives the opportunity to decipher where, how and when Nelson will perform again. (Note: you should know how chess is played and how chessboard squares are enumerated). When investigating a corpse, they like keeping as close as possible to it. It is known this was the second victim of Nelson; the remains of the first victim were never found. You first, Makeda. Do it the best you can. And remember: I'm always one step ahead of you both. I love how weak my victims are, detectives. That's the beauty behind murdering people. Detectives were feeling really agitated. Three murders in less than 3 months. They needed to stop this massacre, so this last chessboard was crucial to find a pattern and predict the next place for a possible crime. You move again, detectives. And know, by the way, I just broke down your car. Mine is wrecked as well, but that won't stop me. Know, by the way, that while you are reading this note, I am killing my 5th victim! There I won't leave any chessboards whatsoever. Will you stop me before I kill my 6th victim? Where (square) will the detectives find the 5th poor soul? Where (square) will Nelson try to kill his 6th victim? When (day and month) does Nelson intend to kill the 6th victim? Can you say anything about how (weapon/method) Nelson intends to murder his 5th victim? Nelson said he wouldn't leave any chessboards in Scene 4, but if he did, what would that chessboard be? First, try to determine what role each piece play (i.e. Brandon, Makeda, Nelson and the Victim). You will note there are two extra pieces. Read through all notes carefully, and in particular, the 3rd note will give you a clue of what those 2 excess pieces are. The number of shots doesn't mean anything - it just adds value to the story. The date of crimes doesn't mean anything either, but they do follow a pattern you need to guess. Detectives suspect that the weapons used to commit the crimes will help them identify which chess piece is playing the role of the serial killer. As some of you have noticed, I wrote g/unpowder instead of gunpowder, and this is not casual. By the way, detectives need to know the name of the weapon used in Scene 1. Can you help them? All questions asked I have answered, with the mate-in-n idea from @RosieF. Whether my answers are correct, I have yet to see. The Flail was found when the knight/Nelson was in the 'F' file, and The Gunpowder was found when the he was in the 'G' file. It seems likly that Nelson's only other weapons are an Axe, a (uh, Boomerang?) , Club, ... you get the idea. The fifth will have been done with a gun, the sixth with another gun. 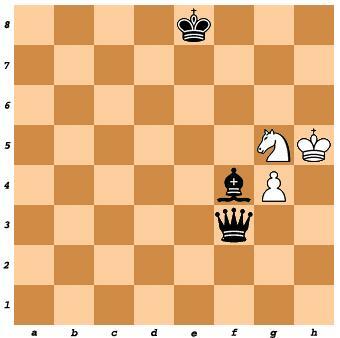 Reasoning: From the third chessboard: Both kings will be in the same positions as before, because they are broken. Both other black pieces do not move, because they can examine the body from where they are. The pawn will be where the knight was (see Q#1). 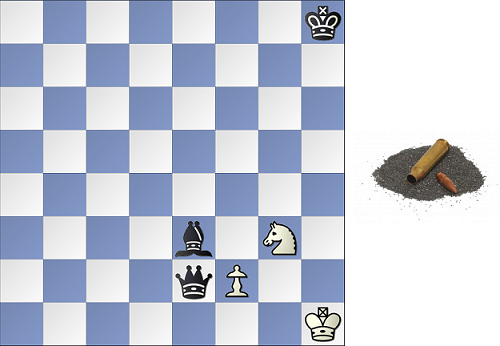 Looking for mate in five position for Knight... Found! [G5]. (@Jasen:) On each board the position of the knight indicates where the victim will be found on the next. (@Bulldogg6404:) The weapons used tell us which file the serial killer's piece is. flail begins with f (the f file) and gunpowder starts with g (the g file, also works with the wordplay "g/unpowder"). last (dead) victim. "I love how weak my victims are" -- pawns are the weakest piece. 2nd thing worth noting: "the detectives like keeping as close as possible to the corpse". So this must also mean that black queen/bishop are the detectives. The kings are the extra pieces: 3rd note says "I just broke down your car. Mine is wrecked as well, but that won't stop me". In Slavic languages, "car" means "tsar"/"czar", the ruler/emperor. So the kings are the cars, and they're not working, but it apparently doesn't matter. Also, hint 1 "in particular, the 3rd note will give you a clue of what those 2 excess pieces are" implies that it is the kings. The dates follow a pattern. Still not sure what the pattern is, thinking about it. 1. Square G4? This would follow the pattern of the knight marking the position of the pawn in the next scene. Feel free to edit and add stuff. Black to move can #3 by 1... Qxf2 2 Ne2 Kg8/Kh7 3 N~ Qg1# I'm not sure that that's relevant, though: a long-range check goes with a close-combat weapon and a close-range check goes with gunpowder?? Black to move can #4 with 1... Qxg3. these are the 2nd, 3rd and 4th murders. That is, the position left at the scene of the $n$th murder is that of a mate-in-$n$ problem, with Black to move and mate. And with the same material. Perhaps the bQ is Nelson and the bB his sidekick? And the bK the Mr Big who stays away from the action but throws in a waiting-move when needed, as in scene 2's 2nd move by Black? Or am I overthinking this? Edited apropos Jose's comment of 20:14Z: Googling Makeda shows that she was the Queen of Sheba (I knew she was called Balqis; hadn't heard of the name Makeda before). So she's the bQ, then? And Brandon the bishop? And Nelson the wK, then? In scene 1, the wK was mated on h2; in scene 2, h1; in scene 3, either e6 or h8. I can't fit that info to the clues, though. and Jose's later clues about how Nelson likes how weak his victims are, and how B & M like to keep close to the corpse -- yes, the victim being the wP now makes sense, but that means that in scenes 2 M destroyed the victim, and in scene 3 M destroyed the victim and Nelson. One of George Washington's horses was named Nelson. the first one is a flail. So the first letter of the weapon's name labels the file on which Nelson/wN stands, in the diagram. 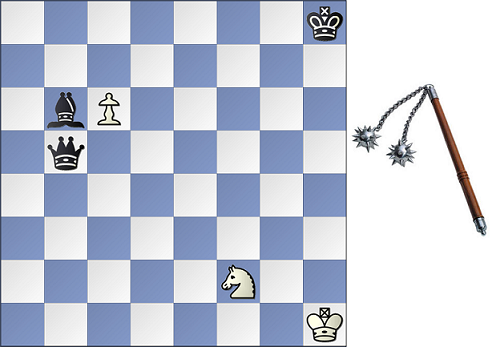 Reasoning: The same material as in the previous diagrams: white king, knight, pawn; black king, queen, bishop. This is pertinent because the chessmen other than the kings represent the characters in the drama, and the set of characters is the same as before. As in the previous diagrams, Black's queen and bishop are on the same file, with the bishop one rank higher than the queen -- perhaps because the bishop represents the superior officer. These black pieces are close to the pawn because "When investigating a corpse, they like keeping as close as possible to it", and the pawn represents the corpse. The previous diagrams solved as "Black to play and mate in $n$" problems with $n=2, 3, 4$ respectively; thus $5$ here. The clue "Both detectives are left-handed" has just struck me -- now I guess that bishop and queen should be to the left of the pawn. 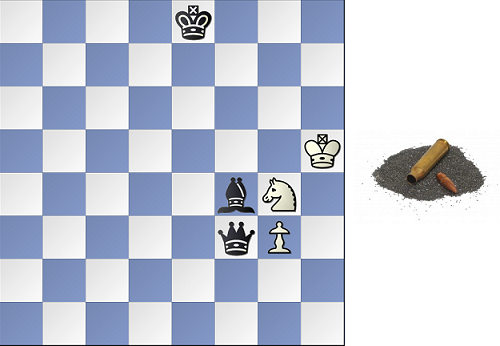 in each scene the pawn is where the knight was in the previous scene. All other reasoning is as before. 1... Qxg4 2. Kf6 Kd6 3. N~ Be5+ 4. Kf7 Qg7+ 5. Ke8 Qe8#/Qg8#. If 3. Kf7 then 3... Be5 or Bh6 also leads to mate in 5. Unfortunately, if there'll be another murder where Nelson is now, Brandon and Makeda won't ever find the body if they continue to work left-handed. Not the answer you're looking for? Browse other questions tagged strategy story knowledge chess or ask your own question. How did the police know?